Cindi from Charmed by Cindi is one of my wonderful sponsors in the upcoming Fall Fashionista event (coming in October 11-17). Her Etsy shop is all about hand stamped jewelry. My favorite piece is the Stacked Family Necklace (pictured on the right). I am a stay home mother of four children ages 16, 9, 6, and 4. > When did you first start making jewelry? I started making hand stamped jewelry after completing my second marathon with my oldest daughter last October. I wanted to be able to give a gift to both of the coaches who made this program work for the second year. I am a huge fan of hand crafted good and I love a good deal. I flipped through the pages of my running magazines and had fallen in love with the hand stamped necklaces and decided it was just too expensive to purchase them that way…. plus I wanted one for myself as well. I did some researching and decided to purchase the supplies myself. Soon I had teammates and friends wanting something personal stamped, too. It flourished from there. > What is your favorite piece of jewelry (that you made)? My favorite piece would have to be an order placed by a mother with thoughts of her son who stutters. The quote that she chose was “Those who stutter teach the world how to listen”. The night I delivered it to her, she could not stop staring at it, touching it, reading it, etc. The look on her face and knowing how it meant to her is what made all the difference. Every order inspires me. I get the most heartfelt and sometimes even heartbreaking requests for pieces of jewelry. I put every bit of care in to each piece and always feel flattered that I have been a part of such important gifts. > What do you like/dislike about selling online? The positive side to selling your product online is that it has the potential to spread on to people in far away places. It can also spread to places very close to home and open your eyes to new opportunities. Social media, blogs, and word of mouth have made it possible for my pieces to be seen all over the world. It amazes me! The downside to selling online is that you miss out on the one on one attention that you would otherwise be able to give someone if you were face to face. I have had a very positive experience with selling this way. I have met a lot of truly wonderful people. > How can people contact you? > Any last words for our readers? One last thing I would want readers to know would be that if you have an idea for something that you feel passionate about- take advantage of it. The past year has been amazing since I have started hand stamping jewelry. I have met some wonderful people, shared amazing stories, & made time to do something different with my time. Thank you Cindy, it was a great pleasure interviewing you and having you as a sponsor! What gorgeous jewelry. I really love the second one! I love stamped jewelry, and it was really cool reading about Cindi and her journey into it, and how she’s touched lives. So cool! 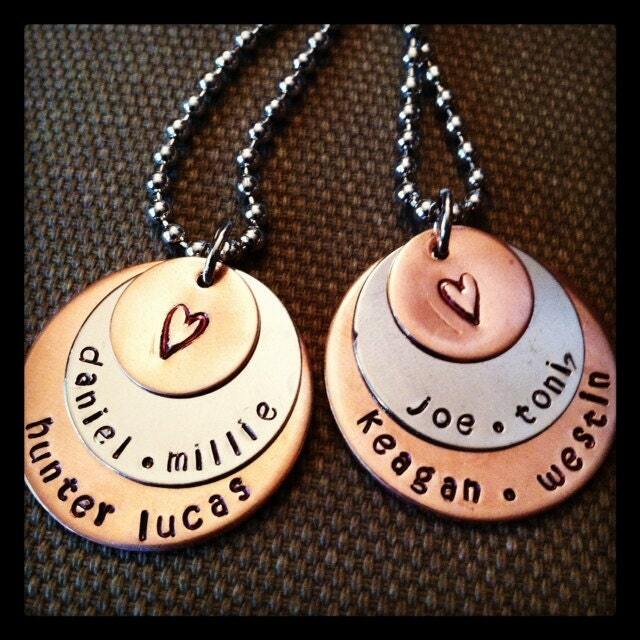 Love hand stamped Jewelry! Very pretty! 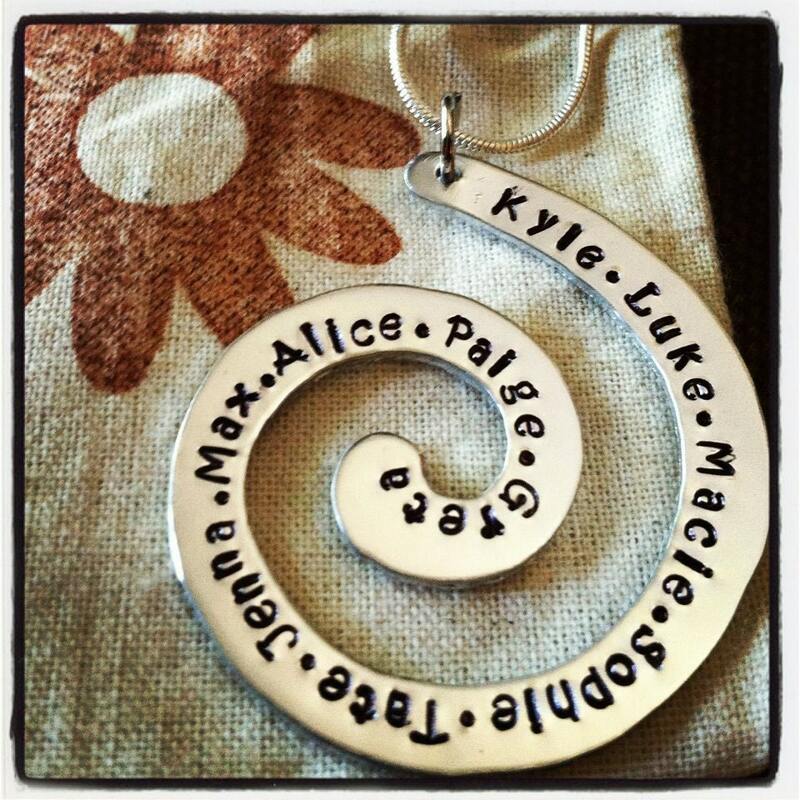 I adore that swirl necklace would be great for my mom to have all the grandchildren on it!! I love the jewelry. How gorgeous! It is always interesting to hear the story behind a business. Cindy is a wonderful artist! The first necklace is beautiful.